Interestingly, our 21st anniversary was celebrated in the jungles of Botswana and with dinner at the Indian restaurant in Maun. North Indian food made by cooks who had been with dhabas in Delhi, so the food was just as authentic ! Today our 24th anniversary, was celebrated with an early morning visit to the awe inspiring Angkor Wat temple in Cambodia. The temple complex is massive even for us Indians who are so used to massive temple structures. What is fascinating is the stories of Ramayana being part of everyday life here in Cambodia. It’s as much a part of their cultural heritage as it is ours. The Angkor Wat is the only temple dedicated to Vishnu while all the other temples are largely dedicated to Shiva. The symmetry just floored us, the story of the Ramayana and the churning of the ocean just transported us to the days of our grandmothers telling us these stories and exchanging stories with our guide was a different cultural experience ! Sita passing through the fire test, Sita in captivity in Lanka, the magnificent Ravana and the even more magnificent Rama.. All etched forever in stone. While King Suryavarman built the Angkor Wat, his subsequent generations built many of the other temples. Jayavarman the 7th was the most prolific builder and built nearly a 100 temples, 100 + hospitals and also converted to Buddhism. Many of the temples have the Buddha statue in place of the Shiva Linga but many of those statues have also been stolen. For our celebratory lunch we chose Dakshin’s which is opposite Siem Reap Referral hospital in the old market and we got real authentic South Indian food !! Mr. Paneer Selvam who has setup this restaurant in 2012 is from Singapore and has managed to create the real thing. I ofcourse asked for dosa which he refused since the batter had not fermented yet :). That’s dedication to delivering just the right taste. This is definitely recommended and we will be back here again. Strangely enough, no store stocks butter in Siem Reap. Cambodians don’t use much butter it seems and that’s what our guide told us. Good for them, one thing off the junk list. Btw, the Cambodian cuisine is largely rice based and the rice tastes great… We just struggled with the pure vegetarian curries and accompaniments. Dakshin’s took care of that for today. Infact we got some packed lunch for tomorrow as well since we will be in an area that doesn’t have vegetarian restaurants. What a great way to spend our special day … The stunning Angkor Wat and almost reading the Ramayana. There is a special spot in the temple where you tap your chest and the sound echoes … The belief is that you let go of all your troubles and we did that today. The visit to Ta Prohm, another stunning temple built by Jayavarman the 7th in memory of his mother … And the Indian Govt is helping in its restoration. Couldn’t have asked for a better way to spend the day ! Hi & thanks for that write up. I am planning a trip there later this year, any suggestions/tips about how to go about it would be greatly appreciated. Will inbox the details Pradeep. Thanks looking forward……….. to your suggestions as well as the trip. For many years my wife & I have been wanting to see the wonders of Angkor Wat. 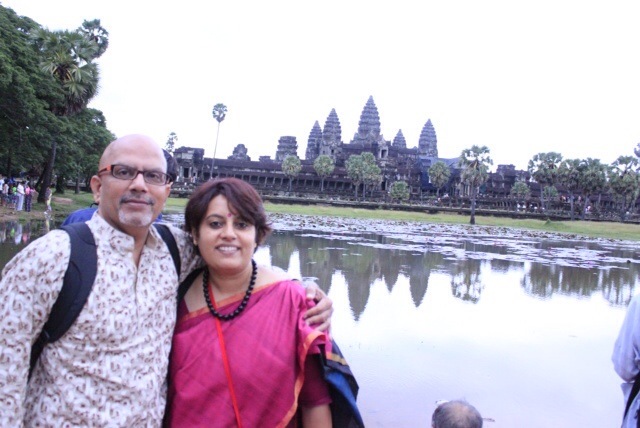 Nice to know that you celebrated your 24th wedding anniversary in Cambodia! 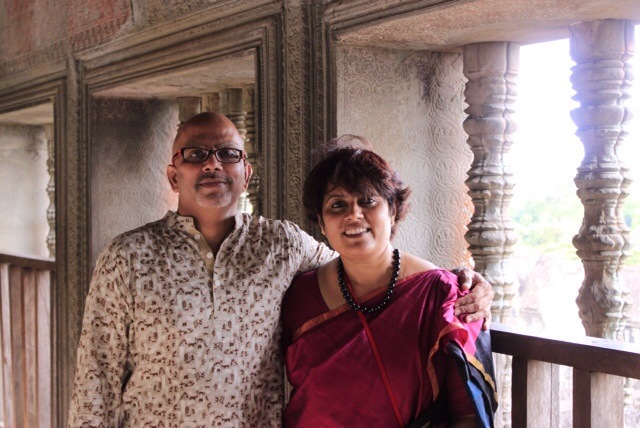 Who knows, it might inspire us to celebrate our 30th wedding anniversary in Angkor Wat. When we do so you will hear from me in my blog! Thanks for the motivation.